Videos, examples, solutions, and lessons to help Grade 5 students learn to make a line plot to display a data set of measurements in fractions of a unit (1/2, 1/4, 1/8). Use operations on fractions for this grade to solve problems involving information presented in line plots. For example, given different measurements of liquid in identical beakers, find the amount of liquid each beaker would contain if the total amount in all the beakers were redistributed equally. I can solve problems using data from line plots. How to interpret line plots by using the given data to answer questions involving fractions and whole numbers? This video guides the viewer through a line plot expressed as a word problem. Caballo created a line plot to show how far he ran each day. Distances listed are in km. What is the total distance he ran? What is the average distance he ran each day? Use the Line Plot above to answer the questions. 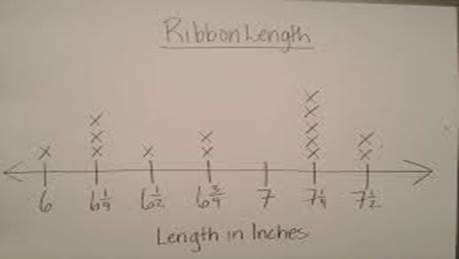 1) What is the length difference between the shortest and longest ribbon? 2) There are 5 ribbons that are 7 ¼ inches. If all 5 ribbons were put together what would there total length be? Give the line plot below a Title and create a story problem to describe the data on the line plot.